Panda-Z chronicles the misadventures of Pan Taron and his giant robot Panda-Z, as they battle the evil Skull Panda and his Warunimal forces. Robots. Pandas. Simple Humor. Take these three ingredients, stir em together and place in thirty 5-minute episodes. Let sit and cool. Enjoy. This is a recipe for success. Well, maybe not success, but at the very least a recipe for a pretty good mini-series. 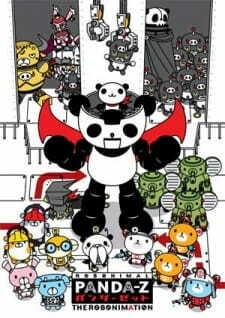 Panda Z: The Robonimation is a cute string of gags and slapstick in the form of slightly inept, animal-shaped mechs. No complicated story, no deep character development, no dramatic adventures or romances...just simple low-key comedy. Now, you might read that and think to yourself "why even bother?". The truth is, not every animu series needs to be a three dimensional wonder that hooks into you with everything it has. Sometimes all a series has to do is do one thing well. Panda Z does this. From the first minute to the final gag, expect to giggle, snicker, smile, and laugh. Panda Z is short, light hearted, and fun. I would suggest any fan of comedy or children shows to check this out. Generally not a continuation based show but when needed they will keep in mind where they left off and remind you if you forgot. This is show is more see what happens before taking action. A waiting game if you will. Not like a mystery where you can keep going looking for clues. Basic. Not terrible like that of a child not a great like that of a pro. When it comes to certain moments like falling the art drops slightly. Animations are not complex. Smooth transitions. The music is a tad too high. Almost screeching like. The music used is kind of catchy depending on episode. Also in relation to episode the music style tends to match the plot/mood for the episode. Some of the animation noises could be improved. Enjoyment: A lot of the times people want the best and the new for it contains more. However, sometimes in life you want to take a step back to relax. This anime would be one of those relaxing choices. Nothing to moderate or hard to follow. Something that can get a chuckle or two per episode without much effort.